As part of my graduate school courses, I created two web logs ("blogs") on various topics. The first blog is simply called: Jessica’s Weblog. This blog was created for the course called Introduction to the Study of Interactive Communications. In this blog, I write about different topics that relate to the study of interactive communications, as well as other materials related to course assignments. 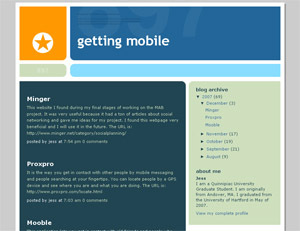 The second blog is called: Getting Mobile. This blog was created for the course called Producing Mobile Media. In this blog, I wrote entries about the different types of social networking websites and applications that are designed for mobile devices. This type of HCI is more complex because the user has a small screen with which to interact.